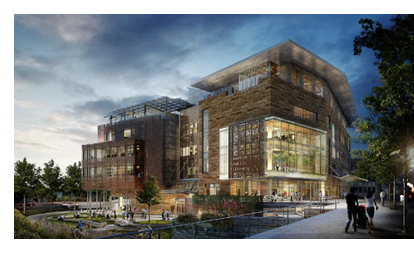 ​​​​​​​​​​AUSTIN – Austin's New Central Library will host a grand opening Oct. 28, 2017 at 710 W. Cesar Chavez St.
After more than four years of construction, the $125 million facility will open in a corner of the Central Business District that is humming with construction. The new library replaces Faulk Central Library at 800 Guadalupe St., which will reduce services starting Aug. 14, 2017 and close for good Sept. 15, 2017. The New Central Library is about 200,000 sf, double the size of Faulk. It boasts some impressive public amenities, including a large atrium, an art gallery space and an eatery that will be run by ELM Restaurant Group, the same company behind Easy Tiger and 24 Diner.